First-term independent U.S. Senator Angus King of Maine received his first official challenger of his 2018 reelection campaign this week as two-term Republican State Senator Eric Brakey (ME-20) announced he would enter the race. Brakey is considered a long-shot with Senator King consistently boasting high approval ratings in a state that has a rich history of supporting independent and third party candidacies. The GOP lawmaker may also find larger-than-life two-term Governor Paul Le Page running for their party’s nomination in the coming months. As of yet, no Democrat has announced their candidacy against King and it remains to be seen whether or not the party will make a bona fide attempt to put forth a serious candidate or whether it will sit this cycle out and perhaps endorse King. King, like fellow independent Vermont U.S. Senator Bernie Sanders, has caucused with the Democrats upon his arrival in the chamber. One might expect King will be rewarded by the Democrats for continuing to caucus with the party after the 2014 cycle, when the GOP took back control of the legislative body. [King had not indicated with which party he would caucus prior to that election]. King, of course, did face Democratic opposition during his initial bid in 2012 – State Representative Cynthia Dill who won only 13.3 percent of the vote as many Democratic voters supported the former two-term governor. With only four independents getting elected to the U.S. Senate a total of six times during the direct election era, there is thin (and mixed) historical precedent to speculate as to whether King will face two major party opponents again in 2018. In general, these independents have won with a majority of the vote – whether they are facing one or two major party opponents on the ballot. One-term incumbent Virginia Democrat Harry Byrd ran as an independent in 1970 after refusing to sign a loyalty oath backing all party nominees (e.g. the eventual 1972 presidential nominee). Byrd won 53.5 percent in his reelection bid with former Democratic state lawmaker George Rawlings receiving 31.2 percent and Republican House of Delegates member Ray Garland at 15.3 percent. Byrd continued to vote with the Democrats on organizational matters as an independent but would frequently support Republicans on policy. The GOP did not put up a challenger against him in 1976 when Byrd sought his third and final term and, as a result, the independent lawmaker cruised to victory by nearly 20 points over Democratic Admiral Elmo Zumwalt with 57.2 percent of the vote. Bernie Sanders, meanwhile, did not face a Democratic opponent in the general election during either of his successful 2006 and 2012 bids. In 2006, the Vermont Democratic Party backed Sanders out of political necessity as the independent congressman was extremely popular in the state. Sanders did not accept the Democratic nomination after winning the September primary and thus faced only Republican Rich Tarrant and minor party candidates in November, winning with 65.4 percent. Democrats supported Sanders again in 2012 when he defeated former Massachusetts State Representative John MacGovern by 46.1 points with 71.0 percent of the vote. Sanders has not yet drawn an official challenger from either major party for his 2018 reelection bid. Besides King, the only other U.S. Senate candidate to win a seat via direct election as an independent was Nebraska’s George Norris in 1936. Norris had been affiliated with the Republican Party for nearly half a century including five terms as a U.S. Representative and four terms as a U.S. Senator. Senator Norris did not toe the party line however, and had not backed the GOP presidential nominee for three consecutive cycles in 1924 (Progressive Robert La Follette), 1928 (Democrat Al Smith), and 1932 (Democrat Franklin Roosevelt). After announcing he would retire at the end of the 74th Congress in 1936, a pro-Norris movement successfully placed the senator on the fall ballot as an independent. Norris agreed to serve if reelected and ended up defeating former five-term GOP Congressman and 1934 U.S. Senate nominee Robert Simmons by 5.0 points with 43.2 percent. Former Democratic U.S. Representative Terry Carpenter won just 18.4 percent. Norris thus became the first independent to win a direct election to the U.S. Senate – and six years later became the first (and so far only) independent to lose a reelection bid to the chamber. Senator Norris lost the 1942 race to Republican State Senator Kenneth Wherry by 20.3 points with the support of only 28.6 percent of Nebraska voters. Radio broadcaster and Democratic nominee Foster May placed third with 22.0 percent. All told, independents have won election to the chamber six times – three times facing two major party nominees (Norris, 1936; Byrd, 1970; King, 2012) and three times facing just one (Byrd, 1976; Sanders, 2006 and 2012). Norris was the only independent to win with a plurality of the vote across these six victories. Additional officeholders have served as independents in the U.S. Senate but were either not elected by popular vote (David Davis of Illinois in 1876), changed their party affiliation after winning election on a partisan ballot (Oregon’s Wayne Morse in 1952, New Hampshire’s Bob Smith in 1999, and Vermont’s Jim Jeffords in 2001), or were appointed to the office (Minnesota’s Dean Barkley in 2012). Next: Will There Be Divided Government After 2018? 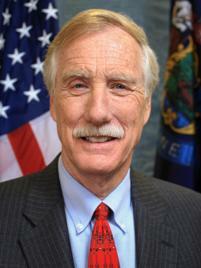 4 Comments on "Will Maine Democrats Field a Nominee Against Angus King in 2018?" 1. “…does not include Lieberman…” Also omitted from the analysis, apparently, are Senators James Buckley (Conservative Party of NY) for the 1970 election, defeating both major party contenders with 39% of vote (with ‘complicit’ support from the Nixon administration, favouring the brother of William F., over the offical R nominee, who happen to be the father of current NFL Commissioner Roger Stokoe Goodell); and Lisa Murkowski (write-in, anti-tea-party) for the 2010 election, garnering 39.5%, edging ahead of both Scott Adams (D nominee) and Joe Miller (party-backed, official R nominee). 2. Would the so-called Ranked Choice Voting system (one used in some US municipalities, as well as for the federal and state parliamentary elections in Australia) be in effect for the Senate election, presuming it is adopted for the state-level (legislature, governor) offices for ’18? Correct – this analysis is focusing on only true ‘independents.’ As such, Strom Thurmond’s successful 1954 U.S. Senate write-in bid was also not included. Actually, Scott McAdams was the 2010 D nominee; he had the misfortune of being abandoned by many traditional D constituencies (e.g. Alaska Natives in “Bush Country”) as well as party elders (e.g. ex-Governor Bill Sheffield) – perhaps figuring that a vote for McAdams is tantamount to a vote for Miller! after continued denying of a need for the safe food act , I certainly hope so !! He has repeatedly shown his opinions to me which I know are invalid misconceptions !